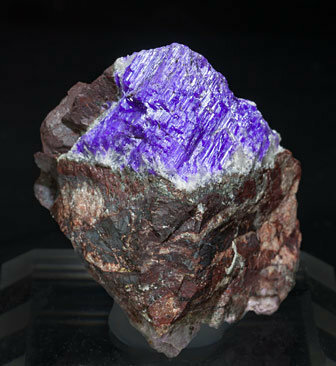 Parallel growths of small Sugilite crystals with good terminations. They are on matrix, with radial sprays of small Pectolite crystals. Very recently we posted this same specimen, but its vivid and uniform bluish color gave us some doubts about its identity, so we removed it until it could be analyzed. We will send the buyer a copy of the analysis confirming that it is sugilite.